The mission of the Fitch Foundation is to support professionals in the field of historic preservation, and to achieve this we provide mid-career grants to those working in preservation, landscape architecture, urban design, environmental planning, materials conservation, decorative arts, architectural design and history, and allied fields. Wednesday, October 21, 2015, 11PM EST. 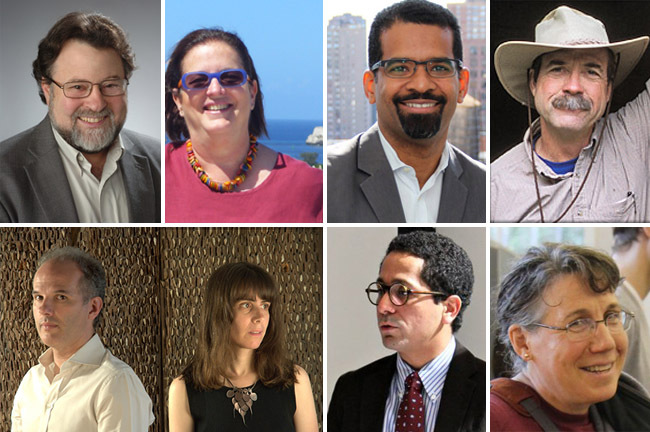 Fitch Fellows, clockwise from top left: Samuel Gruber (’06), Beatriz del Cueto (’14), Angel Ayón (’15), Andrew Gulliford (’91), Sara Wermiel (’08), Edgar Garcia (’13), Alexander Levi and Amanda Schachter (’11 and ’14). Fitch Mid-Career Fellow: Research grants of up to $15,000 will be awarded to one ore more mid-career professionals who have an academic background, professional experience and an established identity in one or more of the following fields: historic preservation, architecture, landscape architecture, urban design, environmental planning, architectural history and the decorative arts. The James Marston Fitch Charitable Foundation will consider proposals for the research and/or the execution of the preservation-related projects in any of these fields. Richard L. Blinder Fellow: This biennial award for up to $15,000 will be presented to an architect for a proposal exploring the preservation of an existing structure, complex of buildings, or genre of building type through addition, renovation, or other means. The proposal may focus on a real project, or it may be a polemical exercise; in either case, originality is highly valued. The proposal must advance architectural preservation in the United States. Samuel H. Kress Mid-Career Fellow: Research grants of up to $15,000 will be awarded to one mid-career professional whose research project relates to the appreciation, interpretation, preservation, study and teaching of European art, architecture and related disciplines from antiquity to the early 19th century, in the context of historic preservation in the United States. Potential Kress Fellow projects could include the exploration of shared European and American influences in style, design, materials, construction techniques, building types, conservation and interpretation methodologies, philosophical and theoretical attitudes, and other factors applicable to preservation in both Europe and America. Applications must be submitted by October 21, 2015, 11PM EST. Please visitwww.fitchfoundation.org to learn more about criteria for evaluation and eligibility.